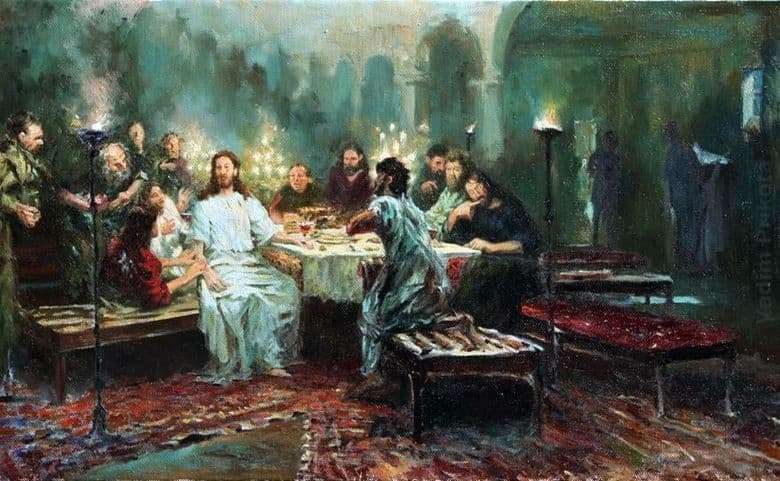 The great artist Ilya Repin created his masterpiece The Last Supper in 1903. Now the picture is in the Novgorod State Museum. The work was canceled. This is one of the biblical scenes. There are a lot of candles and lamps on the table, so the room is well lit. It is light that creates the effect of movement. At the table sits the Master and his 12 disciples-apostles. Each of the 12 people has their own expression. Someone will continue to be faithful to Jesus and go with him to the end, the other will betray and will not blink an eye. Each person sitting at the table has his own facial expressions and thoughts, each of those present does not sit like the others. This gives the plot dynamism. Apostles are depicted indistinctly in free style, schematically. Jesus sits in the center of the table. He, dressed in a white robe, is hard not to notice. It gives it an epic image. The style of this painting – wide free strokes and sketchy style. The color scheme of the picture gives it a vividness and brightness. The room is not only well lit, but also elegantly decorated and quite spacious. This is the home of Simon the leper. It is on this evening that the Son of God will tell about the imminent betrayal and his inevitable death. All are already full after dinner and listen to the predictions of Christ. No one else can believe that their beloved Master will soon be gone. The disciples still listen to the speeches of Christ, and this terrifies them. He is young and full of energy and can not die. This picture turned out to be especially good, because the work of Ilya Yukhimovich began precisely with the painting of icons, the painting of churches. This was his first theme, and it goes through his entire creative legacy. Including she made him famous during his lifetime. Portraits of the artist thanks to master strokes just come to life in his eyes. The artist was so imbued with a religious theme that he even went to the Holy Land to see those Holy places for himself.